The latest Gyro version, equipped with a 4-in-1 infra-red receiver (Gyro, ESC, Mixer, Receiver). 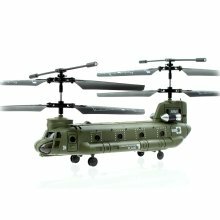 This palm size Helicopter (8.5 inches long) has a very beautiful and detailed fuselage, decorated with flashing LED, the visual effect is great, especially in a soft light indoor area. The Syma Mini Helicopter Series is able to move in 3 Direction base on the 3 Channels, anyone can hover it easily. Since it is very light weight, amazingly it is almost indestructible in any crash, perfect for very first time beginners. This toy helicopter is designed for anyone over 8 years old, flight time is around 5-6 minutes after 20-30 minutes charging. It can fly in 6 directions.Features:Rotate Clockwsie / Anti-Clockwise, Move Forward / Backward,Move Up / Down. In the Box: Helicopter, Remote Controller, USB, Extra Tail Blade, User Manual. 3 channel helicopter, now with gyro built in for even more stability. 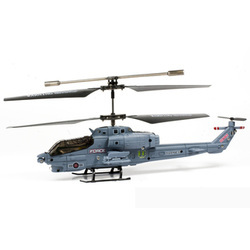 The helicopter is a ready to fly model, which means that everything is included for you to fly, no extra purchases necessary. The S026G resembles a cargo transport helicopter, which is really unique and different than the average helicopter. The S026G comes fully assembled and is ready to fly right out of the box after you charge the battery. 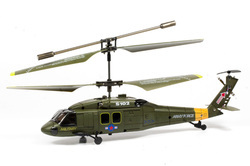 This is a 3 channel helicopter which allows you to navigate the helicopter Up/Down, Left/Right and Forward/Reverse. 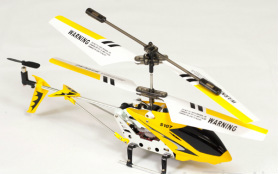 Equipped with a battery that will give you 6-8 minutes of flight time per charge and a controller that only takes 6”AA” batteries, this helicopter is a steal. The 3 channel system the S026G offers is one of the best infrared controlling systems available. With 3 selectable bands, this remote lets you fly up to three different helicopters simultaneously. Smallest micro tandem rc helicopter in the world! 100% Ready-to-fly. Great gifts for kids. Great toy for indoor entertainment! The Syma S102G is equipped with the latest Gyro system and a 4-in-1 infra-red receiver (Gyro, ESC, Mixer, Receiver). This palm size Syma S102G Helicopter (8.5 inches long) has a very beautiful and detailed fuselage, decorated with flashing LED, the visual effect is great, especially in a soft light indoor area. The Syma Mini Helicopter Series is able to move in 3 Direction base on the 3 Channels, anyone can hover it easily. Sport RC Helicopter is very Easy To Fly! It is Best choice for Beginner! Now with metal frame and gyro system (for precision control)!